MKV is an increasingly popular video format, mainly because of its open source roots, and it being increasingly used for H.264 encoding. The problem is that many standalone devices simply do not support the MKV format, often preferring the MP4 container format for use with H.264/MPEG-4 AVC encoding. The PS3 supports the MP4 container, but it has several limitations, least of which is the maximum file size of 4GB (which is not nearly enough for HD content). MP4 files can also only use 2 channel audio. But luckily, the PS3 also supports H.264 streams in other container formats, such as VOB, M2TS and MPG, and some of these do support 5.1 channel audio, as well as removing the 4GB file size limit. This guide shows you how to play MKV files on the PS3, which supports H.264/MPEG-4 AVC, but does not support the MKV container. And do so without re-encoding unless strictly necessary (without re-encoding, the whole process takes less than a minute, and just a couple more with audio re-encoding). A Xbox 360 version of this guide, using the software GOTSent, is available here. This guide uses the mkv2vob tool, which is specifically designed for MKV to a PS3 compatible video format conversion. This guide uses freeware tools only. Download mkv2vob and follow the instructions as set out in the installer. All the required tools are installed for you. mkv2vob is incredibly easy to use, and so you might argue that a guide isn't even necessary. However, there are several options which will determine what kind of file mkv2vob produces. Despite the name, mkv2vob produces more than just VOB files from MKV inputs. In fact, it can produce AVCHD files for burning to disc or to a USB storage device, and it can produce files of the following format: MPG, M2TS, VOB (of course), MP4 and even AVI, as these are all formats supported by the PS3. Start mkv2vob, and click on the "Configuration" tab. Here is the heart of mkv2vob, and we'll go through all the available options and explain just which ones you should change and which ones you should leave well alone. Starting at the top left corner and working our way down, the "Temp Directory" setting allows you to specify where the temporary working files should be stored. This is by default your Windows User temp folder, and there's usually no reason to change it. 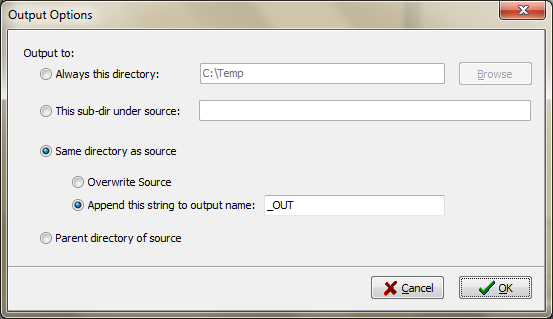 To the right of this option is the "Output Type" option. "File" will create a playable file(s) as the output, while you can select "AVCHD - Disc" if you plan on creating an AVCHD disc, or "AVCHD - USB" if you plan on creating the AVCHD structure on a USB storage device. If you're unsure which to select, then select "File", since AVCHD limits you to how to play back the video on the PS3. Moving down, the "Preferred Audio Language" and two options to the right, the "Preferred Subtitle Language" for when there are multiple audio and subtitle tracks in the input MKV file. If a language is selected, then that language will be the one used to create the output. If the audio language is not found, then the first audio track will be used instead. When a subtitle language is selected, and if that language exists in the input file, and if it is different to the selected audio language, then video transcoding will be automatically enabled regardless of your selected transcoding setting (see below). For example, if you've selected "French" as the audio language, and "English" as the subtitle language (which exists in the input MKV file), then the video will be forced to be transcoded to "encode in" the subtitles into the video, even if you've set "Video Transcoding" to "Never". Note that subtitles are "burned in" types, and so cannot be removed afterwards or turned off during playback. "Video Transcoding" when set to "Automatic" will let mkv2vob determine whether your input video stream needs transcoding to a format that's compatible with the PS3 or not, and this is the recommended setting. On the other hand, you can set it to "Always" to force it to transcode to another format, which takes longer and more processing - this has the potential of wasting a lot of time and reducing quality, but will guarantee compatibility and is recommended if the "Automatic" option did not produce a compatible file. The "Never" option is for the opposite, when you know the file is compatible but mkv2vob determines that it isn't, and you want to skip the transcoding process. Note that this setting may be disregarded depending on your "Preferred Subtitle Language" setting (see above). Moving down again, "File Splitting" sets the maximum size of each file that mkv2vob creates - any larger, and a new file is created. And more importantly than that, depending on where you want to store the file. If storing the a USB drive, it's best to select "FAT32", which will limit the file size to the 4GB limit as required. There are similar settings for Sony memory sticks. Burning to discs is also catered for, with presets for DVD-5, DVD-9 and even single layered Blu-ray. If you're not planning to copy the file over to some kind of media (that is, preferring to stream the file from your PC/network device to your PS3, for example using TVersity), then set this option to "None". "Output File Extension" allows you to manually to specify which format you want the output file to be in. It is best to keep this option set to "Automatic", unless you want to force a particular type of file to be created which could cause compatibility issues. For the "Transcoding Codec", this determines which video codec is to be used if the video needs to be transcoded. For best encoding speed, the default "MPEG-2" option is best, but as you go down the list, you will decrease encoding speed in favour of encoding quality, with "x264 High Bitrate" being the slowest, but the highest quality preset. Of course, this option is only relevant if transcoding is to be used. For files that you are likely to keep for a long time and for HD content, it is probably worth selecting one of the x264 options, especially if you have a fast PC. 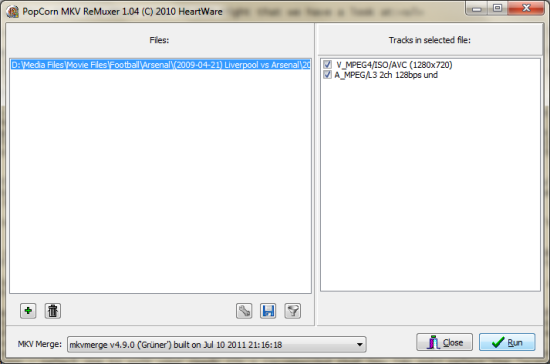 For view and then delete items and SD stuff, MPEG-2 will be good enough, although selecting XviD may also be worthwhile. Always Encode Subtitles: Selecting this option will force subtitles to be encoded even if the subtitle language is the same as the selected audio language. We'll now load in our input MKV file. Click on the "Add File" tab and use the "Browse" button to load in your "Source File". You should also specify an output location. The "Delete source file after conversion" will remove the source MKV file after conversion, but this is not recommended (in the event the output file was not perfect, losing the source file is a bit annoying). Then press the "Add File" button to start the conversion process. Or if you need to convert a bunch of MKV files at the same time, you can put them all in the same folder, click on the "Add Directory" tab in mkv2vob and specify the "Source Directory" and mkv2vob will convert all files in the folder. Press the "Add Directory" button to start the conversion process. One of the more frequent errors you may encounter is the infamous "TSMuxer has stopped responding" error. This usually indicates a problem with the MKV file structure. Luckily, there is an easy to fix problem - simple remux the MKV file (or to put in more plainly, reconstruct the MKV file from scratch, but without having to re-encode the video/audio - this should take a matter of seconds, as opposed to hours with a full re-encoding). What you need to do is to first download and install MKVToolnix. Afterwards, download and install Popcorn MKV Remuxer (which uses MKVToolnix to perform the remuxing) and then run Remuxer. Once open, press the "Save" style icon, this sets the output options - select one to suit your needs (it's recommended that you *do not* select the "overwrite source" option, as this means you'll lose your original file in the process - only overwrite the original if you've confirmed the newly re-muxed MKV file is fully working!). Then press the green "+" button to load in your file(s) - you can select multiple MKV files for batch processing if needed. After that, all you need to do is to press the "Run" button and Popcorn MKV Remuxer will do the rest. Afterwards, load the newly created MKV file into mkv2vob again, and the "TSMuxer has stopped responding" should hopefully no longer appear. Now all you have to do is to take your new PS3 compatible video file and get it to play on the PS3. If you chose AVCHD - Disc, then you need to burn the AVCHD files to a DVD or Blu-ray disc. If you chose AVCHD - USB, then copy the files to your USB device. Otherwise, you can use a software like TVersity to stream the file from your computer to your PS3 (instructions for doing this are here. Got more questions? Post them in our MPEG-4 AVC (H.264) Forum and get them answered by other expert users.